Our Quick Tips are designed to help you build your business skills, a few minutes at a time. 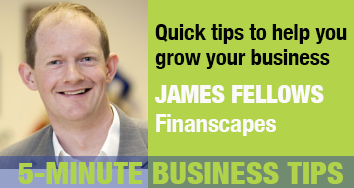 James mention the Essential Business Nudges, sign up for our free weekly reminders of the things you can and should be doing to build your business. There are half a million new businesses started every year, but the majority of them die within the first few years. Now, it’s not going to be a surprise to anyone that it’s not a dead cert that your business is going to fly, but it does mean, you need to plan to make sure you’re in the minority to make it. My tips are, first, think ahead. Thinking is cheap. Giving it a try is expensive and failing outright hurts. The good news is, if you’re listening to this and you’re using the Essential Business resources, then you’re already better than most and part way there, but it’s not enough just to have a look. You need to think things through in terms of your own business and your own number and see whether your idea is going to pay. That’s one of the reasons I like the Essential Business Nudges, the very first one challenges you to ask yourself whether you’re going to be earning enough. For me, you haven’t thought things through until you can see a profit graph and a cash flow graph in front of you. It doesn’t have to be hard. It doesn’t have to be painful. Choose a tool that what I mean, you don’t have to go through reams and reams of numbers. You don’t have to look at tables. It just presents things visually for you, so that you can shortcut to making better decisions. It’s really easy to think that your idea is going to pay. Everyone is confident that their idea is great, but until you blend the numbers together in your own specific circumstances and think about how many you’re going to sell, how much each one is going to be sold for and think about what your costs are, it’s impossible to know whether your idea is an opportunity, a bit of a hobby … or just a whole pile of stress. The second thing I’d say is, stuff happens. Once you’ve built your forecast and it looks like it’s going to work, you’re in a great place. Now though, it’s time to acknowledge that the world isn’t quite as predictable as it might be and things can change, so make a copy of your forecast and start to make some tweaks. This is what banks and funders call ‘stress testing’. Drop your sales forecast a little bit, especially in the first three to six months. Factor in some contingency or unforeseen costs. Now think about what might change in your industry and what impact that would have on you and the way that you sell, and see whether your business still stands up. If with these changes, the business isn’t going to fly, great. You know that in advance now so you change your plans. You can do things differently. You can put contingencies in place so that you can cope with or avoid that scenario. The third tip is guess smart. Make better informed decisions. You fight to the end, what happens if the environment changes? What happens if things go wrong? Now, think about, what could you do a bit different in the business to drive yourself, to drive your profitability? For example, what if you had to stand on an exhibition? Factor in the cost of it and the impact on the sales and see whether it pays back, see whether your profitability goes up and see whether you cash flow can handle it. What if you got a loan to pay for some new equipment or a software that make you more productive? Could you introduce another product line? If so, when could you do it? Would you need to take on more staff? Model these ideas and compare them with your baseline business forecast and decide whether or not these are good things to do. This is the kind of information that changes you from being an employee in a business to the business owner, taking smart, well-informed decisions to build your business will make all the difference. Lastly, you’re special and so are other people. This is a lesson that it took too long for me to learn. You’re starting this business because you’re absolutely the greatest, something you’re passionate about that you enjoy it. In fact, it’s probably loads of things, but you won’t be great at everything, so you’ve got a choice. Do you risk your time and money and your business having a crack at those things that you’re no good at? Or do you find someone who is great at it and pay them to do it? Now, it doesn’t have to be expensive. I’ve built my entire business on an associate model, using freelancers to do all the things that I’m just not great at. Things like marketing, things like software development, so find yourself a freelancer. Someone who’s got your same attention to quality, but that’s got skills that you need. You can ask all the business owners for recommendations, for example, to reduce the cost of getting an offer. The beauty of freelance is that you just pay for what you need so that there are no long-term commitment or fixed cost like staff. You can ramp up and ramp down whenever you want to. This is one of the reasons I think being part of a local start-up community, whether it’s enterprise agency, university or whatever, is so powerful. You can check out the people around you and choose only the best. Again, run the numbers, factor in the cost and feed through the impact and the implications for your business, for your sales and then make an informed decision. That’s what forecasting is all about. It’s all about making better informed decisions, up front, in advance to give your business the best possible chance of success and giving you the best possible chance of owning a really successful business.